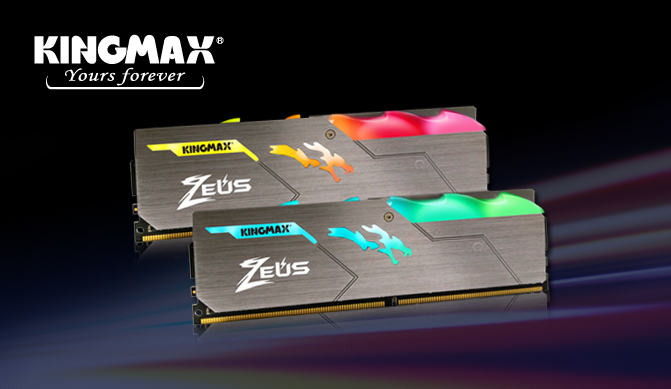 KINGMAX Technology Inc., the world’s leading provider of memory products, today is proud to announce the launch of Zeus Dragon DDR4 RGB gaming memory module. The Zeus Dragon DDR4 RGB RAM features incredibly fascinating design with RGB lighting and furious speeds of up to 3466MHz. The Zeus Dragon DDR4 RGB RAM enables enhanced visual experiences and superior performance for gaming, overclocking and PC modding. Zeus Dragon DDR4 RGB RAM is designed with stunning RGB LEDs that provide vibrant lighting to match your style of system. The chips support ASUS AURA II Sync which allows users to create custom lighting effects that can be synchronized with common activities such as music, gaming, and even CPU/GPU temperature. Furthermore, the Zeus Dragon DDR4 RGB RAM gets an edgy look with the dragon-like heat spreader that gives your system a touch of style. And the high-quality aluminum heat spreader can always keep your RAM cool for it enables increased thermal dissipation and therefore ensures incredible cooling effect. Especially designed for gaming and overclocking enthusiasts, Zeus Dragon DDR4 RGB RAM provides a perfect combination of ultra-fast speeds and aggressive timings. The fastest DDR4 RAM of Zeus Dragon series can run at the speed of 3466MHz paired with quick CL-16 timing that it can deliver ultra-fast transfer speed of 27,700 MB/s. The Zeus Dragon DDR4 RGB RAM guarantees high compatibility for it has passed multiple motherboard tests. It also supports Intel XMP2.0 profiles to allow automatic and optimized overclocking performance. In order to meet different gaming, overclocking and modding requirements, the Zeus Dragon series offers various frequency choices of 2666MHz/ 3000MHz/ 3200MHz/ 3466MHz and is available in single modules and kits of 2 with capacities of up to 32GB.